A mattress protector can be an excellent investment. Primarily, it is designed to protect your mattress from wear and tear, spillages and all sorts of dirt and grime, such as sweat and dust, that accumulate as you sleep. In this way, it can really help to prolong the lifespan of a mattress. If you’ve ever bought one, you’ll know what an expense they can be, so anything that can stretch their lifespan is very welcome! In addition to that primary function, they can also perform additional roles such as this product from Eco Living Friendly, which is specially designed to ensure that people with allergies can all get a good nights sleep. Throughout this piece, we’ll see how it achieves that, and also if it can still perform its other functions as a mattress protector. 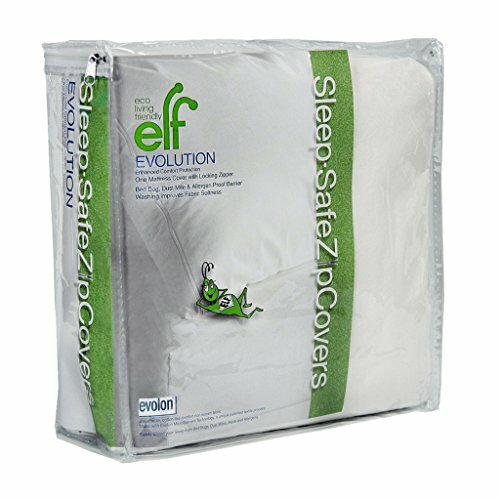 Designed in Germany by the company Eco Living Friendly, the Evolon model mattress protector has been specifically designed to be used by people with allergies or sensitivities to dyes and materials that many other mattress protectors are manufactured from. Of course, there already exists a range of protectors marketed as hypoallergenic. The difference here, though, is in how that protection is offered. With a standard hypoallergenic protector, they are manufactured from passive materials like cotton. This product is not just constructed of hypoallergenic materials, it also actively filters and prevents allergens from affecting the sleeper, adding an extra level of protection. Primarily, this product is of course going to be aimed at people with allergies who require a hypoallergenic product to sleep on. Given its proactive nature though, it is particularly suited for people with disorders such as asthma. By tackling allergens such as dust that can rise from a mattress and affect asthma suffers in particular, this mattress could go a long way to helping these people get a good night’s sleep. In addition to that though, the product also has to perform its main job too – which is to protect the mattress itself. In the packet, you will find one mattress protector of the zippered type. This means that it completely encases the mattress and zips closed at the back. Because of this, each protector is designed to fit the size of mattress marked on the packaging exactly. It’s therefore very important that your purchase the right size for your mattress. As we mentioned above, the first great feature of this product is the fact that it is of the zippered type of protector styles. Combined with the construction material, which we’ll get to in a second, it really helps to make this a premium-level hypoallergenic mattress protector. By encasing the mattress, it prevents any allergens such as dust or dust mites leaving the mattress during the night, which really helps to protect the sensitive airways of asthma sufferers in particular. Many people also have allergies to the plastics, dyes, and chemicals that can be used in making standard protectors. You have no need to be concerned about that here, as this product has been designed from the ground up to be as sensitive as possible. The soft, cotton-like fabric used here is PVC-free, has no chemical after treatments, and is uncoated. As well as being extremely hypoallergenic, the material is also comfortable to sleep on. It is lovely and soft and it doesn’t rustle like many protectors that incorporate plastic in their design, meaning light sleepers won’t be kept awake when they move in their sleep. As far as protection goes, the material allows airflow through to the mattress, but it does so through microfilament technology. What that means is that cool air can get to the mattress to avoid hot spots of body heat building up overnight, but larger sized allergens are filtered out and kept inside the protector where they can do no harm. Because it has no plastic though, it also isn’t waterproof. What it does instead is absorb fluids and then evaporate them. That might not be ideal for spillages that could happen, for example, with a potty-training child. To really get the most out of it, just make sure to keep it clean by washing it every two to three months. Follow the instructions that come with the product of course, but this guide to washing and cleaning mattress protectors is also very helpful. Whilst this is a superbly designed and built product, the lack of waterproofing could be an issue in some circumstances. If you’re looking for high-end hypoallergenic materials that also have a better degree of waterproofing, you could also consider this product from SafeRest. All in all, this really is an excellent product if the main consideration in your purchase is to find a truly hypoallergenic product. Not only does it boast the allergen-free materials and construction you would expect, but it also has the added advantage of actively filtering allergens to make for a truly supreme product for a relatively low-, mid-range price. Privyet!While working on a design project in my city of Kostroma Russia, I met this crazy American designer and we found that we had many design likes in common.We've been on a wild design adventure all over the world ever since!